Our work attempts to dissect the myriad roles of RNA binding proteins in mammalian gene expression. RNA processing reactions such as pre-mRNA splicing, mRNA export, translation and mRNA decay are influenced by the interplay of trans-acting proteins with their cognate cis-acting RNA elements. We believe that by elucidating the cis-acting RNA elements recognized by specific RNA binding proteins it will be possible to gain a better understanding of both the physiological relevance and mechanisms of action for these critical regulators of gene expression. The experiments conducted by our group explore post-transcriptional gene regulation in the context of human cell culture, developmental and cancer models. We are currently studying the serine and arginine-rich family of pre-mRNA splicing factors (SR proteins) as well as the insulin-like growth factor II mRNA binding protein 3 (IMP-3). The SR proteins, like IMP-3 are linked to cellular transformation and tumor metastasis. We believe that analysis of these proteins will provide important insights to human disease as well as our basic understanding of mechanisms of gene regulation. The laboratory employs a powerful genomic approach to map protein-RNA interactions occurring in the context of living cells. This stringent approach relies on recent advances in the area of ultra high-throughput DNA sequencing technology to identify individual binding sites within a complex pool of RNA transcripts. Computational approaches are required to transform the raw sequences into the genomic landscape recognized by each RNA binding protein. Specific hypotheses are then tested using a variety of cell-based and biochemical assays. Please follow this link to find the lab's publications in the National Library of Medicine's PubMed database. 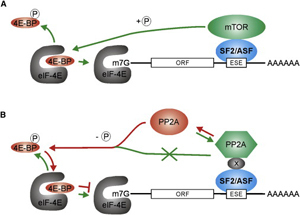 Two Non-Mutually Exclusive Models for the Activation of Translation Initiation of a Subset of mRNAs Bound by the Shuttling Protein SF2/ASF. For details see Mechlewski et al. (2008) Mol Cell 30:179-189.